On Jan. 10, a much bandied about rumor finally became official as the Southern League announced the sale of the Huntsville Stars to an ownership group led by veteran Minor League operator Ken Young. The Stars, entering their 30th season at Huntsville's Joe Davis Stadium, will move to Biloxi, Miss., for the 2015 campaign. It's time to get busy transforming the site across from Beau Rivage [Casino] into a $35 million baseball stadium for Biloxi's AA ball club. ... Dale Partners is the firm in charge of the project. Biloxi has yet to secure the $21 million needed to build the stadium. City officials must hammer out some lease agreements and contractual issues with the Southern League, then work on putting the financing together. "We'll come back and finalize the issues related to the contract and get the City Council, the team and Beau Rivage in agreement. Once that's done, we'll sell the bonds. It will take us, once all that's done, about 30 days to have money in hand to start paying vendors," Biloxi CAO [Chief Administrative Officer] David Nichols said. In related and decidedly more lighthearted news, the Mississippi Press Gulf Live Blog has launched an informal name-the-team contest for the Biloxi franchise. Seabees, Mudbugs, Fighting SeaTurtles, Bay Beaus and Gopher Frogs are among the contenders; Sand Crabs, the name of Biloxi's 1908 Cotton States League team, sadly has been left off the list. The investors in the planned Fredericksburg Minor league baseball complex plan to purchase the land in February, break ground in March and have the facility ready for the start of the 2015 season. 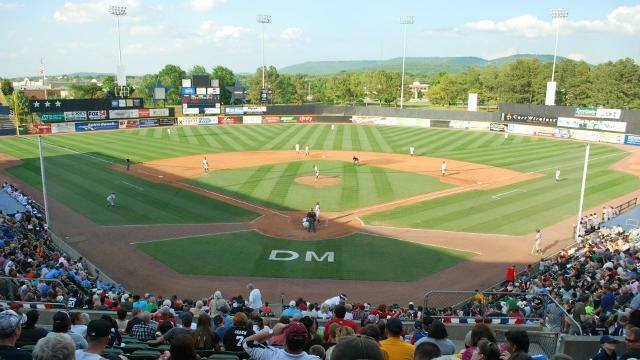 The complex is a joint venture between the owners of the Hagerstown Suns, a Class A affiliate of the Washington Nationals, and Diamond Nation, a New Jersey-based company that runs amateur baseball and softball camps and tournaments. The owners of those two entities, along with Rosner Automotive Group principal Ron Rosner, plan to buy the 38-acre parcel in Celebrate Virginia South where the U.S. National Slavery Museum was once planned. A 4,750-seat baseball stadium for the relocated minor league team and five artificial turf fields for Diamond Nation youth and amateur baseball and softball camps and tournaments will be built there. If the above timeline is indeed adhered to (far from a sure thing, given that the land hasn't been purchased yet), then 2014 will be the Suns' 34th and final season in Hagerstown. City officials there have stated in the past that, if the Suns relocate, they will pursue other professional baseball options for venerable Municipal Stadium. The study was done by Brailsford & Dunlavey, whose firm has worked with more than 125 governmental entities on sports venues. ... Analyst Jason Thompson with Brailsford & Dunlavey said the Columbia market can support a Minor League baseball team. But the city would have to lure an existing team to town. An 8,000 seat stadium would cost an estimated $42 million. Columbia's Minor League Baseball aspirations have the enthusiastic backing of Jason Freier, who owns both the Fort Wayne TinCaps and Savannah Sand Gnats. According to South Carolina's The State newspaper, Freier has guaranteed that, if the city musters the funding for a ballpark, he would be able to bring a team there. Columbia last fielded a Minor League team in the form of the SAL's Capital City Bombers, who relocated to Greenville, S.C., following the 2004 campaign. Per the Tampa Tribune, a plan to move the Tampa Yankees to the city of Ocala has hit a serious roadblock due to widespread concern over the use of tax dollars to build a new stadium. "It does not appear likely the funding mechanism for the stadium ... will be placed on a referendum in time for the project to proceed as planned," Yankee Global Enterprises senior vice president Anthony Bruno wrote in a letter read to city council. "While we expected to bring the community together with this project, it unfortunately has become a source of division." The Tampa Yankees currently play at George Steinbrenner Field, which also serves as the Spring Training home of the big league Yankees. Meanwhile, in the Orlando suburb of Winter Park, city officials have begun exploring options for a new Minor League Baseball stadium. The Orlando market has been without a Minor League team since 2003, when the Southern League Orlando Rays relocated to Montgomery, Ala.
Back over on the Gulf Coast, there is uncertainty surrounding the Blue Jays' future Spring Training home and potentially their FSL franchise in Dunedin. Again per The Tampa Tribune, plans have hit a snag to relocate the Jays' Spring Training facility to Palm Beach Gardens, in a complex that would have been shared with the Houston Astros. The Tribune does a good job explaining all of the potential moving pieces, including St. Lucie County perhaps stepping into Palm Beach Gardens' place to build the multi-club complex and Dunedin seeking a tenant to replace the Blue Jays should they leave. There's a lot of "potential" and "perhaps" in this situation, so stay tuned. Dunedin has been the Blue Jays' Spring Training home since the Major League club's inception in 1977. While the above items all involve the building of new stadiums, the West Michigan Whitecaps are in the midst of rebuilding their current one. A fire on Jan. 3 caused major damage to Fifth Third Ballpark, leveling approximately 40 percent of the facility, but the Detroit Tigers' Class A affiliate has pledged to be ready for the club's home opener on April 8. On Monday, the team provided a glimpse into just how much rebuilding needs to be done, posting 37 photos to their Fifth Third Ballpark Rebuild photo album on Facebook. As that effort proceeds, the Whitecaps and their fans are set to receive a much-needed morale boost. On Jan. 23, 20 current Tigers players, coaches and executives are slated to appear at the team's annual Hot Stove Dinner.